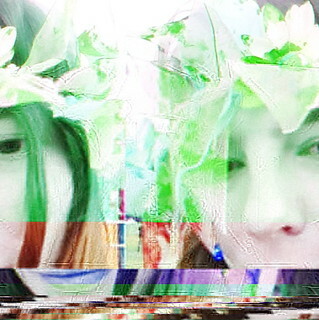 At EMFCamp, I was lucky enough to get a place on the Introduction to Glitch Art workshop run by Antonio Roberts. The workshop attendees plugged in their laptops and sat at tables in the workshops tent, while Antonio explained what glitch art was and showed us some examples, including some of his own great glitch art. (Have a look at Antonio's website). The important thing to remember when doing this was to try not to affect the header, as this could break the file entirely. We then saved the files and opened them again in GIMP to see how they looked. It was interesting to contrast between what happens to images with different file formats, as the effects could be quite different depending if it was a .jpg or a .bmp. 2. Opened an image file in Audacity and then applied effects, such as Echo. 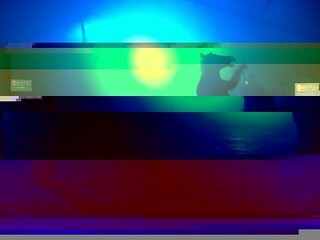 Here are Antonio's instructions on how to do this: Databending using Audacity. Antonio also showed us some effects he created using Pure Data, and also talked about how he uses scripts to create cool effects, and I think he talked a bit about editing videos also.